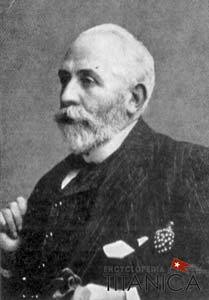 Alexander Montgomery Carlisle left Harland & Wolff in 1910; he had joined the firm as a student apprentice at age 16 in 1870. Over recent years speculation about the circumstances of his leaving the firm have become popular "fact". 21268. At the present moment I think you have retired from business? – I retired on the 30th of June, 1910. 21362. You had resigned your position with Harland and Wolff in 1910? – I had. Carlisle himself made it clear that he had retired. There is no mention whether he left on his own, nor that this had something to do with the lifeboats. Actually, the meetings with Ismay, Sanderson and Pirrie took place in October 1909 and January 1910,2 so if his leaving resulted had from an argument about the lifeboats, one has to wonder why he had not left already in January. Furthermore, Carlisle gave an interview to the Daily Mail published on 18 April 1912 and makes no mention of any conflict there either. Instead, we learn a few questions later at the British Inquiry, from Carlisle himself, that no decision had been reached about the boats before he left H&W. 21416. If it was not settled, was there any circumstance discussed or any time mentioned at which it should be decided what should be the number of boats? – Not that I heard of. 21417. Now then, from January, 1910, when this interview took place, until June, 1910, when you left, was there anything more said in your presence by the White Star directors or any member of the White Star Company? – No. 21418. Nothing? – No. I merely ordered the davits after that - the same month. 21420. And was there, while you were still connected with the firm, any decision arrived at to your knowledge with regard to the number of boats? – None that I know of. 21421. Do you know what you were waiting for at that time; that is to say, do you know why no definite decision had been arrived at up to June, 1910, as to the number of boats? – I would say they were entirely waiting to see what the Board of Trade would require. Carlisle was also questioned on 3 April 1914 during the Limitation on Liability Hearings. Again he mentioned his retirement and makes clear that the lifeboat question was still open when he left. Q. Did you allow the Directors: Messrs. Ismay and Sanderson, to understand perfectly how many lifeboats could be fitted? – The plan showed how the pair of davits held them, but the number of boats was not gone into. The actual number of boats fitted in the ship was settled after I left the yard. "The Right Hon. A. M. Carlisle, owing to ill-health, has retired from the management of the great shipbuilding yard on Queen's Island, Belfast." "He had worked hard, and his health was not good. He crossed to live in London." "Mr. Carlisle took little care of his health. He was out in all kinds of weather without an overcoat. He had a daily swim in the Serpentine, even on Christmas day. A chill, which he could not shake off, was the cause of his death in 1925." "And yet to many of us there was a difference of the saddest import. (...) To me it was a positive grief to miss him, to know that he did not see what is the crowning feat of a full life. The Right Hon. A. M. Carlisle is no longer of the great firm of Harland and Wolff, and although yesterday he took a final look round the microcosm which he has controlled so long, to-day he did not fill the place where he has for so long been the central figure. Lord Pirrie and Mr Bruce Ismay, two of the foremost and worthiest figures in the shipbuilding and shipowning world to-day – one might almost say the foremost – were there, and must have missed him sadly, for from their serene heights of organising ability they could realise, perhaps better than any other person, what he has stood for in such a wonderful business as this; and none can know better than they how the wonderful certainty and smoothness of to-day's epoch-making ceremony were due to his plans, perfected months ago." "His retirement caused general regret not only in shipbuilding circles in Belfast, but also in Great Britain and the Continent where he was well liked as a genial and friendly man. he had the highest capacity in managing men and controlling affairs, whether he was directing the 'thousand and one' details in connection with the largest shipbuilding yard in the world, or supervising the building of a mammoth liner that would break all records in size and speed. He was a "Captain of Industry," and any city might be proud of him." This picture of Carlisle appears in the Daily Mail on 22 April 1912 showing Carlisle on his way to the Memorial Service in St. Paul's Cathedral. The Right Hon. A. M. Carlisle, the late general manager of Messrs. Harland and Wolff, who built the Titanic and partly designed her. He was present at the memorial service at St. Paul's Cathedral when he fainted. As we see, Carlisle's retirement was due to health issues rather than on the question of how many lifeboats the ships would have, or any made-up conflict with his brother-in-law Lord Pirrie. As already shown in part 1 of "The lifeboat story", Titanic Post, Nr. 82, December 2012 (TVS), Atlantic Daily Bulletin, December 2012 (BTS), he thought the ships should carry at last 48 lifeboats. British Inquiry, Day 20, Questions 21373 - 21381. British Inquiry, Day 20, Question 21288, 21297. Carlisle was born 8 July 1854. The same report appears in The Courier dated 9 August 1910. Page 375, with thanks to Dr Paul Lee. The Daily Mail was quoted in a few other newspapers stating that Carlisle retired. 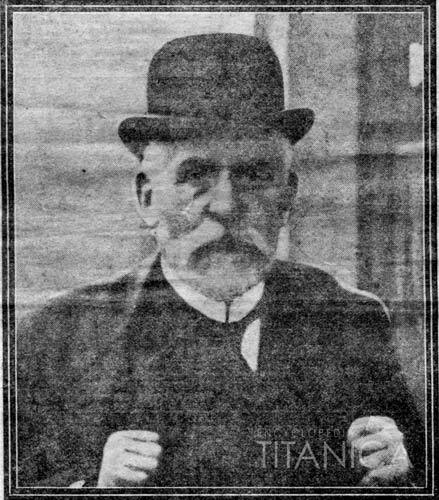 According to Daniel Klistorner during his research for the book Titanic in Photographs, it was printed in August 1910. The report appears in the newspapers Wanganui Herald 3 October 1910, Auckland Star 6 October 1910.
with thanks to Günter Bäbler. Join the Carlisle's Retirement – Separating fact from fiction discussion on our message board, 4 posts, last post by Henry Sincic.